With so many people deciding to try their hand at raising urban chickens, it's inevitable that some aren't finding success and have to give up their chooks. Whether they find themselves with a rooster due to inaccurate sexing or simply didn't understand the responsibility of caring for an animal 24/7/365, someone ultimately has to take care of the birds. While Craigslist and online chicken groups are good resources that conscientious urban chicken farmers use to try to find new homes, less savvy folks simply take their birds to the local animal shelter and drop them off, or worse, take the birds to the edge of town and let them loose. Here's where animal sanctuaries step in to help. 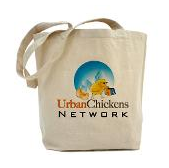 And what with the surge in popularity of urban chickens, the sanctuaries are busier than ever. So, while we're celebrating this season of giving, I hope you'll consider donating to your local animal sanctuary. A few animal sanctuaries have formed a Coalition Concerned with Chicken Welfare and you can support them at their web sites (listed below). While I don't condone the Coalition's ham-fisted approach to chicken welfare by urging municipalities to outlaw urban chickens, these organizations provide a valuable service in providing chickens a refuge of last resort.